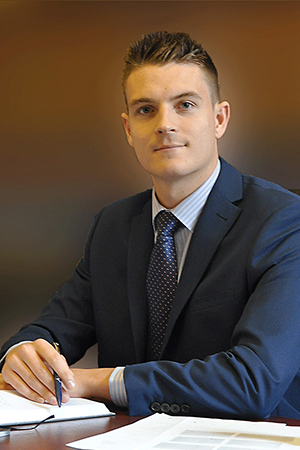 Iestyn qualified as a Solicitor in 2016 and became a Partner in the firm in April 2017. A fluent Welsh speaker from Whiltand, Iestyn attended Ysgol Gyfun Gymraeg Bro Myrddin where he was appointed head prefect, before graduating from Cardiff University in 2012 with Upper Second-Class honours in Law (2.1). Following this he joined the Carmarthenshire County Council Childcare Legal Department as a paralegal, accumulating substantial case experience over 12 months. In June 2014 Iestyn completed the Legal Practice Course at Cardiff Law School and was awarded a Distinction. His areas of work include Agriculture, Private Client, Commercial and Property. Iestyn is a keen sportsman. Having represented Wales cricket at junior level, he played for Cardiff University first XI before being appointed club Chairman. He is currently captain of Whitland cricket club and having enjoyed playing for the highly successful Whitland Youth rugby team for 3 years, he converted to playing football and now turns out at centre half for St. Clears AFC. Away from work and sport, Iestyn enjoys walking his dogs along the West Wales coastline.